Stamos, Margot Kidder, Jennifer Beals, Tom Hanks, John Candy, Raquel Welch, Cher, Tina Turner, Buddy Ebsen, Ernest Borgnine, Jimmy Stewart, Burt Reynolds, and Bruce Springsteen signed after playing 3 shows that day including Shea Stadium. So . . . you always wondered what it would feel like to hit a few licks on Eddie Van Halen’s white “Striker” guitar. Or perhaps you’ve dreamed about wrapping yourself in a denim jacket that once graced George Michael’s bod. How about wailing R-E-S-P-E-C-T! while sporting a pair of Aretha’s earrings? You can turn your fantasies into realities this Sunday at the Philadelphia Music Foundation’s 2nd Annual Rock ‘N’ Roll Auction at the Holiday Inn, City Avenue and Presidential Blvd. The doors open at 2 and the bidding starts at 4. Proceeds from the event – which its organizers hope will exceed the $17,500 raised last year – will benefit the Foundation’s scholarship fund and educational programs. 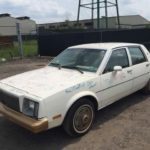 Highlighting the auction will be a 1981 white and gold Buick Skylark signed by Bruce Springsteen & The E Street Band, Sting, Elton John, Rod Stewart, Jackson Brown, Diane Sawyer, Rosanna Arquette, Margo Kidder and other celebrity types. 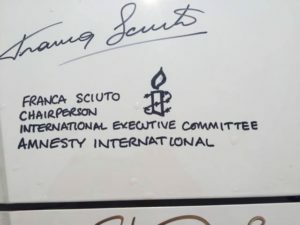 Proceeds from the sale of the car will be split between Amnesty International and the Foundation. John DeBella will emcee. 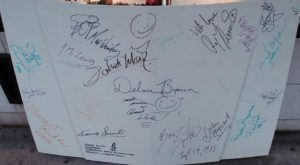 Joining him are celebrity auctioneers Yakov Smirnoff, Ray Murray, Liz Starr and Robert Hazard. Radio personalities Ed Sciaky, Helen Leicht and Welch & Woody also will be on hand. Foundation chairman Larry Magid reported that the stars were happy to oblige. “In many cases people wanted to give us even more things than we could take,” he said. “Some have donated platinum and gold records, which is something I haven’t seen happen before. In addition to items from the music world, there are also sports items up for grabs. Julius Erving’s sneakers, a pair of Charles Barkley’s autographed Nikes, a 76ers basketball autographed by the 1989 starting team, a Louisville Slugger autographed by Von Hayes and Mike Quick’s autographed football shoes are among the sports prizes to be sold to the highest bidder. For the more practical minded, breakfast with DeBella on the Morning Zoo, a pair of tickets to every Electric Factory concert in 1989 and five hours of studio time at Sigma Sound Studios are among the specialty items awaiting you. If you’re more in a mood to buy than bid, there will be more than 2,000 items for sale including classic T-shirts, autographed LP’s and CD’s, rock memorabilia, tour and promotional items and photos for sale. E-mail info@gottahaveit.com or call (212)-750-7900 for more information. Next Next post: Shop What’s New at Gotta Have it!